The frontier settlers of Kentucky played a pivotal role in the Revolutionary War, specifically at the Battle of King’s Mountain on October 7, 1780. The early settlers of Six Mile Creek, affectionately known as “Six-Milites”, jumped at the call to arms to battle the oppressive British rule their families had fled in what many historians have called the decisive battle between Patriot and Loyalist militias (let’s call them the home and away team for a reference of who’s who). Colonel Isaac Shelby was one of several Patriot militia leaders to defeat British Major Patrick Ferguson in Cherokee County, South Carolina, 9 miles south of King’s Mountain in present-day North Carolina. 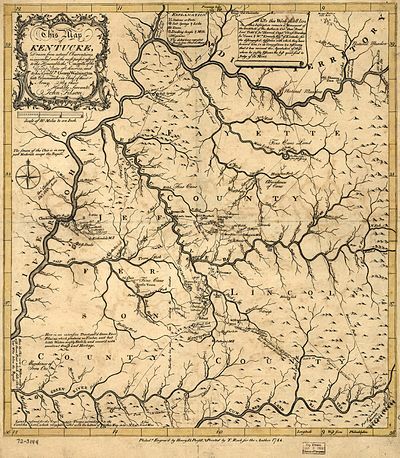 John Filson created the first map of “Kentucke” in 1784 as a gift to General George Washington. The most exciting part, in our opinion, is that on this brilliantly detailed document, “6 Mile Cr.” is clearly labeled! This historic document provides a particular foundation displaying the origins of our distillery and our beloved land. 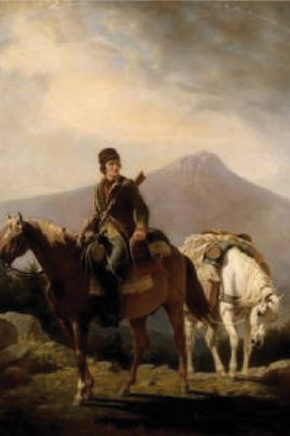 Squire Boone, Daniel Boone’s younger brother, was every bit as good an explorer and Indian fighter, with the same wanderlust. Squire – his name, not a title – was also one of the founding fathers of Kentucky, one of the area’s first whiskey distillers, a politician, and a master gunsmith. Squire was an amazing frontiersman. He survived 17 violent encounters with Native Americans – some fought hand-to-hand. By the end of his life, his body sported eight bullet wounds, a right arm an inch-and-a-half shorter than his left because it had not mended properly after a gunshot wound, and a scar left by a tomahawk across his face. In 1782, Squire purchased more than 12,000 acres of unclaimed land near present Shelby and Henry Counties, including what is now Six Mile Creek Distillery. As you enjoy your Six Mile Creek bourbon, raise a toast to the exploring spirit of Squire Boone and all the other brave pioneers who settled this country. Without them, we wouldn’t be here today. 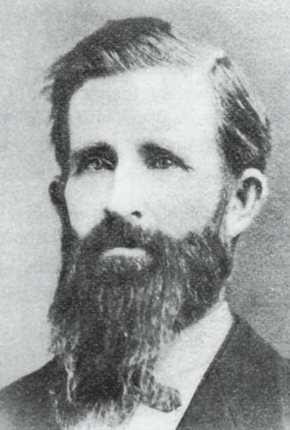 Much of what we know about the original patriots who settled Six-Mile Creek comes from newspaper articles written in 1873 and 1903 by George Whitfield Demaree. His ancestors were French Hugenots who migrated with the Low Dutch to Mercer County, Kentucky. Demaree – also known as “Mr. D” by his contemporaries – was a lawyer, magistrate, breeder of prize Jersey cattle, and a renowned beekeeper on his farm in Christianburg, Kentucky. He was a pioneer in “swarm control,” and his findings allowed bees to be transported out West for the pollen-ization of crops that helped make permanent settlement possible. Mr. D somehow found time in his busy life to be an amateur historian, too. In his newspaper articles, he documented the history of Six-Mile Creek – the “wonderfully meandering, famous stream” – from the early days of the pioneers to the Civil War. He noted the inhabitants were called the “Six-Milites” by those occupying higher and supposedly better ground. Judging by the names, those Six-Milites were Irish, Scotch, Welsh, French, and Scotch-Irish – tenacious, strong, and fearless. They were attracted to Six-Mile Creek because of the abundant fish and game and the freedom to live as they chose. “The ‘old settlers of ‘Six-Mile Creek’ were … adventurers, depending solely on individual grit, unsupported by community aid,” Mr. D wrote. He determined that the first permanent settler with a family on Six-Mile was Jiles Harlow, who lived to be nearly 100 years old. Harlow fathered more than 20 children, resided in a cabin with a dirt floor, and in his old age believed he had the gift of “conjuration” – the ability to heal the sick or injured. Spoken like a true patriot. Six Mile Creek, or “6 Mile Cr.” as John Filson noted on his map to his excellency, General George Washington, was one of the best places to settle on the Kentucky frontier. Smaller tributaries to our creek didn’t have adequate water volumes for daily living and sustenance activities like milling. Six Mile Creek provided a sustainable environment and location for early Kentucky pioneers. Here they could climb to the top of hills to stand lookout for hostile peoples, and they could also live down in the Six Mile Creek river basin, with a plentiful source of fresh clean water, and the ability to defend their settlements. These early pioneers milled corn, fermented it, and distilled the beer mash into the first Kentucky whiskeys. 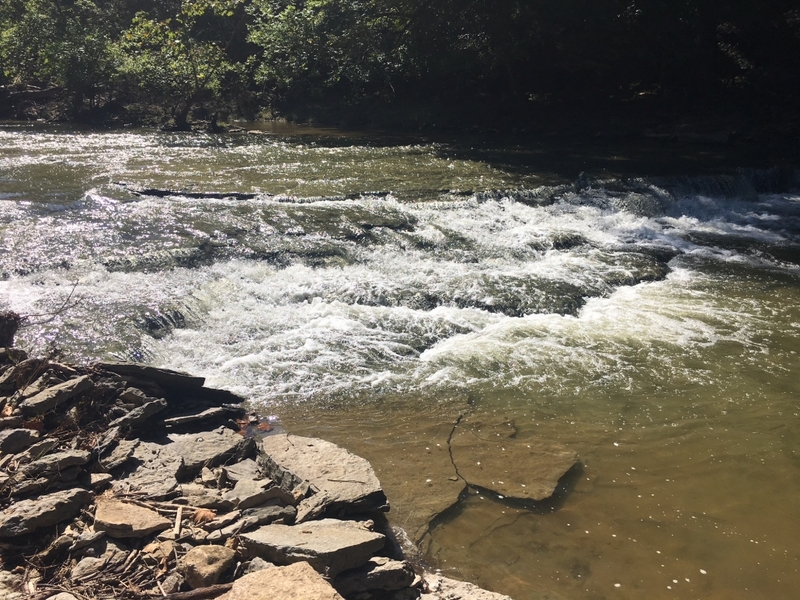 Six Mile Creek itself is home to many species of fish, including smallmouth bass, and one can see a myriad of fresh water mussels and their shells, the hallmark of a naturally healthy creek. Our remote location is free from runoff and other sediments, and this is why pioneer settlers, and Squire Boone, found the Six Mile Creek valley the perfect place to live.